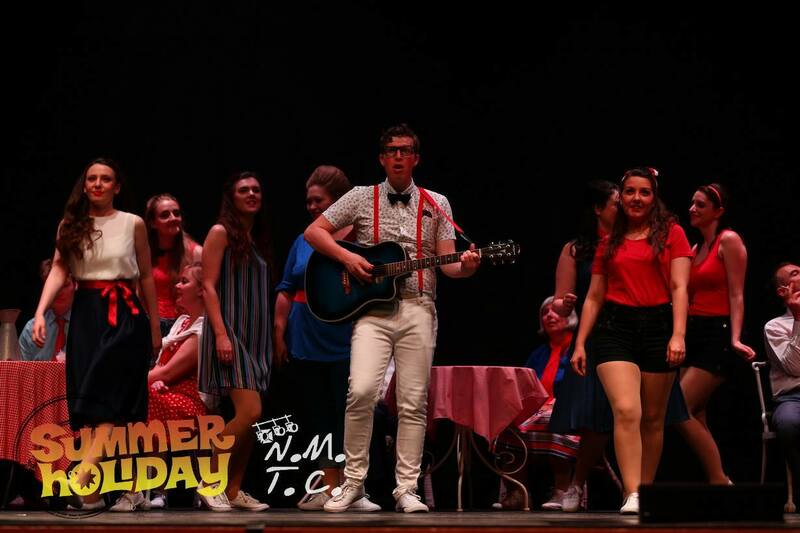 I had a bit of a downer on their previous show Grease. While it was well performed, its selection was a bit questionable, and it is a pretty poor stage show, nowhere near like the film. Therefore I was a tad concerned that Summer Holiday, a slightly generic film might not translate to the stage too well either. The film as much as I remember of it is simple popcorn fodder built around a few good tunes and a star name, and the stage show it turns out is pretty much the same without the sunny filming locations. 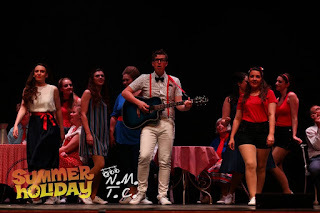 More than willing to take on the challenge of iconic people following his stint as John Travolta in Grease, George Johnston is back onstage as the Cliff Richard lead Don. While I felt he missed the Zuko swagger in Grease, here he feels much more relaxed and is definite building leading man material. Some of the lighter songs he can't quite nail, but when he can, with songs like We Say Yeah (ironically not in the original film, but in The Young Ones) he is not only an excellent performer but a great stage presence. 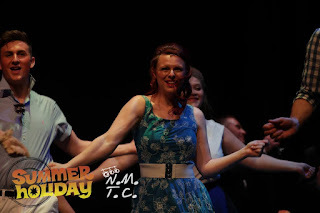 Clearly, the best vocal performer of the show is Katy McNaughtan as Barbara, who makes an immediate impact with Constantly, but perhaps is at her very best in her songs in the second act after her evolution of the character. There is great fun and entertainment to be had from Mimsie (Helen Kennedy), Angie (Ella Styles) and Alma (Hannah Taylor) as the travelling singers both in their brilliant vocal performances but also the fun to be had from their comic scenes, including their deliberately clumsy Gee Whizz, It's You. There's high value also from Barbara's pursuing mother Stella (Eleanor Digby) and her agent Jerry (a really terrific comic turn from Brett Hanson and his uncomfortably large maracas). There is also a brief but gorgeous solo performance of Lei Vuole Ballare by Katy Bachelor, which offers a nice moment of very different music. Centre: Helen Kennedy (Charley, I mean Mimsie) andleft Harvey Morris (Steve). 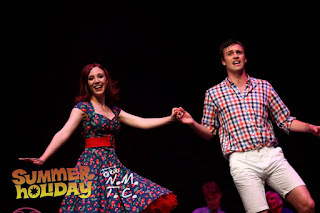 The star of the show though is Ben Stanton and his brilliant Edwin, tagging along for the ride, Ben plays the role with a sort of Eric Morecambe mannerisms and maintains a great dialect which he carries brilliantly into the singing numbers, where he is confident and strong with his highlight being Move It which brings him into Buddy Holly territory. It really is a brilliant performance and one which steals many a scene. 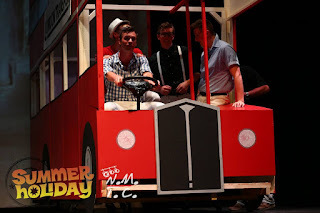 The famous bus of the show is brought to life on the stage with an emphasis on cute rather than realistic in its very cartoony aspect, as is Shady the car, which also has a perfect comic book moment of its own where you can imagine the sound balloons in your head. I mustn't mention the point where the bus appears to be driving sideways though, so I won't. The bus also dared to fight back during the evening I saw the show but there was a hero stage hand to the rescue and the audience genuinely loved it for that perfect "this is live" moment. Kudos also for Ben Stanton's brilliant recovery "this trip is taking a long time" moment, makes you want it to happen every show. Adding to the cartoon moments is a truly magic moment featuring the ferry which I don't want spoil, but safe to say it was an audience favourite of the night. Ben Stanton (Edwin) and cast. At the further mention of the audience, its pretty safe to say that my evening they were a seriously comatose affair, totally not active in any way and the show deserved better reception through many of the scenes. The age old thought that every audience is different was really prominent with this lot. I feel certain that the audience will be more responsive for the rest of the performances. 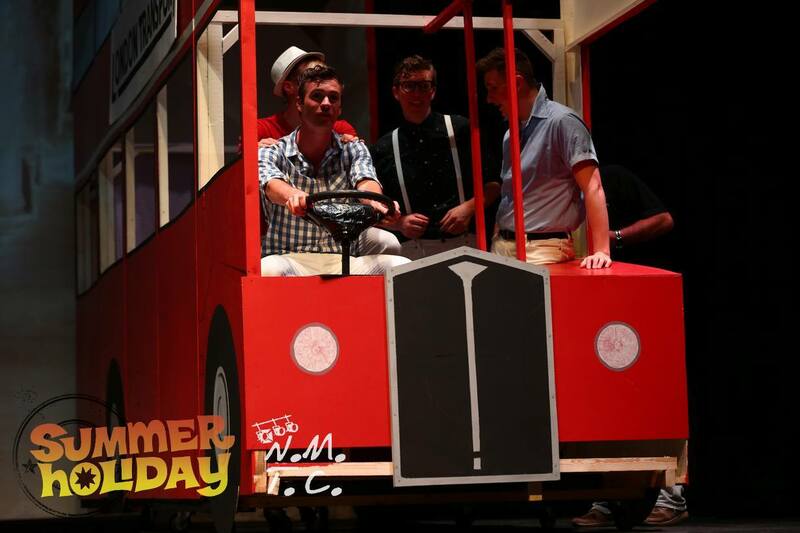 So, if you enjoyed Grease last year you are sure to enjoy Summer Holiday. It is a much better structured play for one and full of some great songs, including a huge number of especially good ones not in the original film, fleshing it out and making the show better for it. This coupled with some great comic moments makes this a show that you will not leave disappointed from. Performance reviewed: Thursday 1st June 2017 at the Cripps Hall Theatre. The Northampton Musical Theatre Company performs Summer until Saturday 3rd June 2017 (with a matinee on Saturday).